Reserved Seating at Alamo Drafthouse – Yeah Baby! The following tale is neither a fabrication nor a dream. Recently I arrived at an Alamo Drafthouse less than 30 minutes before my movie started and got an awesom seat. I wasn’t skipping work at 10am on a Tuesday nor was I watching a bad movie on its way out of theaters. 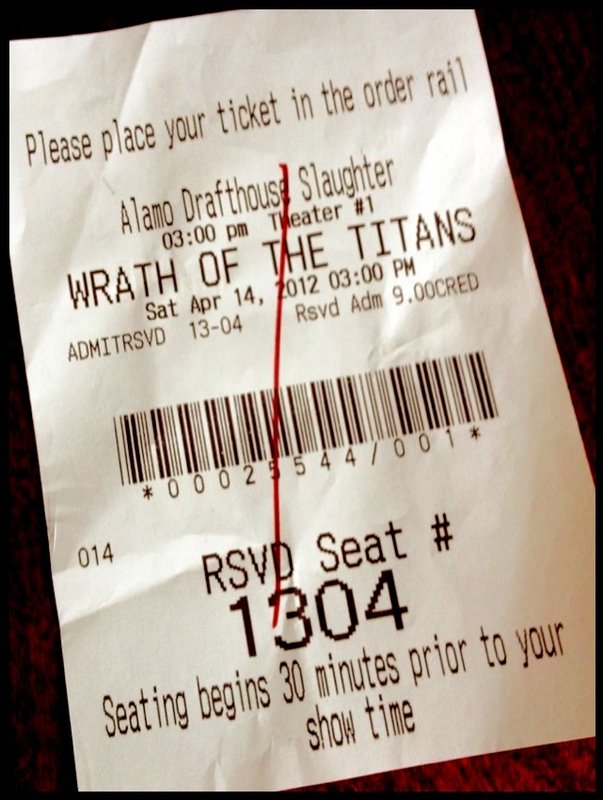 Even so, I wasn’t the only one at this movie and I got a great seat, my tardiness – in Alamo time anyway – notwithstanding. What’s my secret? Who do I know? Who did I have to blackmail? Great seats at Alamo usually come at a price and that price is precious time spent standing in line for an hour or more before a movie. So clearly there were shenanigans afoot. Happily, no felony was committed in the acquisition of my prime movie viewing location. Instead I availed myself of Alamo’s newly minted (and apparently recently revised) reserved seating option. For just a mere two dollars more than a regular ticket price you can now reserve a specific seat in the theater that remains yours even if you slide into the theater during the previews. Until now this marvel known as reserved movie seats was only available at the upscale (and up-priced) iPic theater at the Domain. With base seats starting at $19 and the comfy reclining seats even mor expensive at $29, iPic is truly a special occasion location. In the past I’ve believed its well worth the price – in my time-strapped opinion anyway – when you want to watch a premier of a major release ( Harry Potter or Twilight are two recent premiers I’ve watched there) without the hassle of standing in line for hours on end. I’ll be honest, I’m just too old to camp out for any movie. For all other not-so-special-or-screaming-pre-teen-filled movies where nibbles and beverages (other than hot dogs and Icees) are desired, Alamo is of course the best option. And with reserve seating it’s gone beyond best to out of this world fantastic. And if the concept of reserved seating itself wasn’t just plain lovely, you can even pick specific seats within the reserved section. If you’re a sit smack dab in the middle sort of person then those seats are yours. If you prefer the aisle for quick access to restrooms then the aisle it is. Seat selection is first come first serve, so if you buy the last two tickets you’ll have to take what you can get. And once all the reserved seats are gone it’s back to general admission otherwise known as the cinema cattle call. Only the Ritz, South Lamar, and Slaughter Lane theaters currently offer the reserved ticket system. For those of us more northerly we’re SOL or we have to travel a bit further. I desperately hope they extend this system to all Drafthouses in town. There are only 20 or so reserved seats so you have to buy your tickets in advance to be assured you’ll have access to this seating nirvana. For premier weekends this means planning ahead a bit and watching for notes on when tickets go on sale. I’d say this is a decent reason to sign up for the Alamo newsletter. The online ticketing system doesn’t play particularly well with a mobile device, or at least it didn’t with my iPhone. You can buy a reserved ticket but when you try to select your seat the system gets hyper confused and makes you start the process again. If you just buy the reserved ticket without making a selection a seat is assigned to you, which may be okay but may not be depending on the size of your theater-going party. You can also buy reserved seats from Fandango but they won’t let you select a seat either, so there’s some work to be done for the mobile ticket buyer. The few blimishes aside, I’m beyond thrilled that Alamo has developed this new approach to seating. It makes me love them even more as an Austin original (even if they are building a new theater in NYC) and helps me fit a great movie experience into my busy life. Of course I may have just shot myself in the foot by raving about reserved seating in this public forum, but the story just had to be told. By the way, the new Slaughter Lane location where I tested the reserved seating system is great. It’s clear Alamo took all of the lessons they’ve learned over the last few years and put them to good use when planning this newest theater. The rows are wider so it’s easier for everyone to move around in the theater, there are small tables shared by every pair of seats so it’s easier to get in and out of a row, and the lobby and adjacent restaurant 44 Rabbit are perfect for hanging out before or after a movie. The food and drinks are about the same as those at every other Alamo although they do offer seasonal specials and a few unique items. All-in-all it’s very well executed. You might also want to keep metal knives around for those times when ceramic knives just can’t. Titanium is another material that is widely used in making knifes. com and author of Dodging The Bullet and Operation Charisma. This is the miracle that happens every http://peacockweddinginvitations.net/invites/161208273160368555_modern_swirl_peacock_feathers_monogram_monogrammed_5x7_paper_invitation_card time to those who really love the more they give, the more they possess.